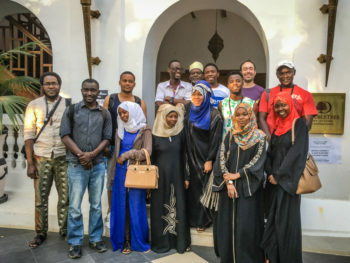 This past July we had the unique opportunity to take our documentary filmmaking workshops to the Zanzibar International Film Festival, the premiere film festival in East Africa, held annually on the picturesque island of Zanzibar, just off the coast of mainland Tanzania. As the festival itself spanned only nine days, and we were included as just a part of its vast programming, our typically three-week workshop had to be condensed into just five days, making it a true crash course! Taking on this unique challenge, our group of participants was an interesting mix, ranging in age from early twenties to mid-sixties, and in experience from award-winning filmmakers to total novices. Thankfully the seasoned filmmakers, across the board, were extremely generous, by sharing what they knew, as well as sharing their filmmaking equipment, and even teaming up with those with less experience on their filmmaking projects. 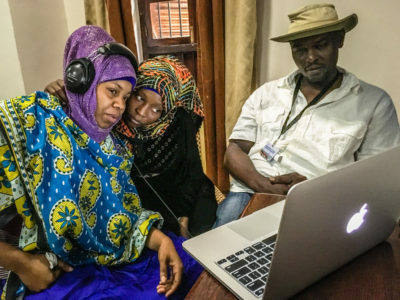 Kinyanjui David (right) supervises his filmmaking group members during the sound mix of their short film, Mwalimu Hassan. Of particular note was Kenyan filmmaker, Kinyanjui David, who both won the award at ZIFF this year for best short film, as well as did the sound mixing on the film that won this year in the best feature category. Considered by many to be the number one location sound recordist in Kenya, he naturally became a co-facilitator in the workshop, by teaching the unit on sound recording. And along with two beginning filmmakers, he also shot and directed a documentary in the workshop itself, Mwalimu Hassan, that stands as one of the very best films every made in our course… and in only five days! 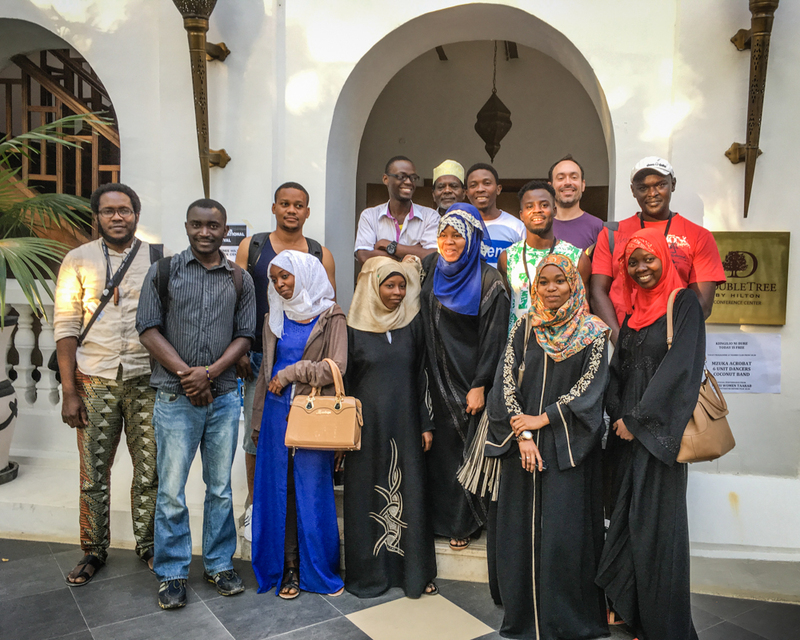 Besides being much, much shorter than our typical courses, our workshops with ZIFF also marked the first time that our head facilitator, Steve Clack, taught in a region where he did not speak the native language… Swahili in this case. While many students, luckily, were proficient in English, a good portion of the class was not. For this reason we had an English-Swahili translator, Malik Kiki, on the first days of our workshops. And when Malik could no longer attend, participants like Kinyanjui David, Alfredy Jackson, and Tanzanian director, Jackson Fute, stepped up to make sure that everyone stayed up to speed with the material covered. It was truly amazing how well things functioned, under this impromptu teamwork. And it opened our eyes to the potential of bringing our workshops to ANY world region… no longer limiting ourselves by the few languages that we speak. Youth, which direction are we headed? In conclusion we’d like to thank Zanzibar International Film Festival President and CEO, Dr. Martin Mhando, for inviting us, ZIFF Workshops Coordinator, Edima Otuokon, for providing us support on the ground, the Double Tree Hotel in Stone Town, Zanzibar, for providing us the space to teach our workshops, and the entire ZIFF community, for welcoming us into their family and helping our budding filmmakers realize their dreams!